After the likes of 1996’s Jerry Maguire, a film about a NFL (National Football League) agent who struggles to stay in the business for doing the right thing, and 2011’s multiple Oscar nominee Moneyball, that’s based on the true accounts of a MLB (Major League Baseball) team’s general manager who uses sophisticated methods to sign the right players with the budget he has, comes Draft Day, that’s about Sonny Weaver, Jr. (played by Kevin Costner), an under fire general manager of the Cleveland Browns who has only 10 hours left to decide how he’s going to make the best out of the coming NFL Draft that’ll potentially end the team’s losing streak, or to make a “splash” that’ll continue to sell tickets. 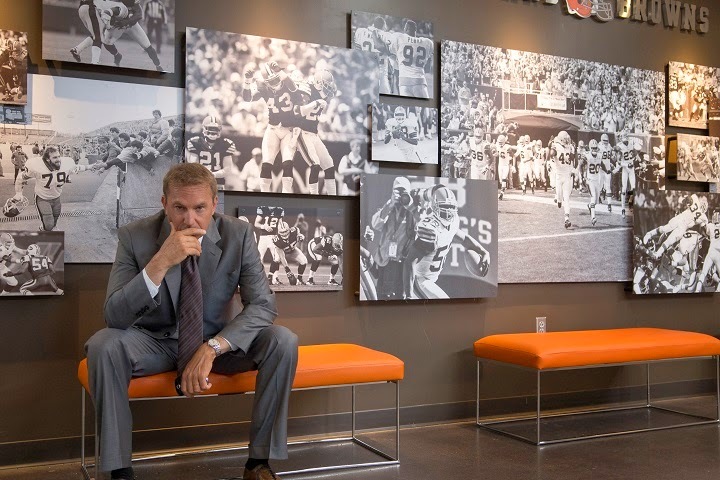 Jerry Maguire was inspired by a real life sports agent while Moneyball was based on a true story but Draft Day is, from what I gathered, a complete fiction but it has it’s own interesting premise. Not only that the protagonist has face a lot of pressure from every side at work in these 10 remaining hours struggling to decide to do the right thing or do what everyone wants, he also have to consider for the players as their future depends on it. 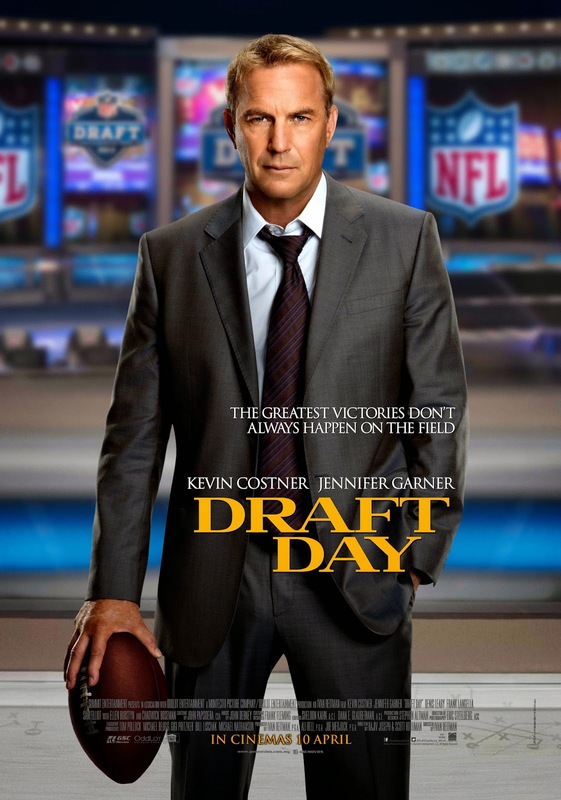 The narrative of the film is smartly done with quick indirect educational dialogues that’ll help the clueless audience to grasp what NFL Draft exactly is and why does it seem like a big deal. However, if you’re hoping to see a lot of American football action, this is not that kind of sports film. I think it even has lesser action of the sport than in Jerry Maguire, and it’s no where as intelligent of a film as Moneyball, but it’s still very fun seeing how the general manager digs ways to make a great draft pick and to justify the decision without failing anyone that matters. There are the usual do-the-right-thing and the “American dream” themes in the story with thoroughly cheesy dialogues, plenty of cliched moments, not-very-realistic portrayal of the real thing, and a typical Hollywood ending, but this ending may be effective enough to uplift most audience and get them pumping their fists in the hearts. I’d be frank, it somehow got my eyes a little teary although the film doesn’t exactly tries too hard with the developing the other characters. The true winner and most memorable moment of the film is definitely Chadwick Boseman’s hilarious and yet heartfelt facial expression at the end. Seriously, I don’t remember anyone pulling this expression off so fittingly. Boseman plays Vontae Mack, one of the more passionate potential in the draft with a more humble family background. Kevin Costner’s role as Sonny Weaver, Jr. is not a stroll in the park, while the multiple awards-winning actor has to play the almost-emotionless face in most scenes due to his character’s age and experience with his job, he also has to portray deeper glimpses of the pain, anger and heavy pressure he’s feeling. Jennifer Garner plays Sonny’s unrealistically awesome colleague, Ali, whom he’s also having an affair with. Garner certainly doesn’t standout in the film but her gorgeous mature office lady look provides much needed eye candy. Censorship in Malaysia: I’ve only noticed two strange brief skips at the media screening at GSC Mid Valley Megamall. I’d assume it’s due to vulgarity, but it really didn’t seem like there was going to be any in those conversations. Second opinion: My girlfriend liked the film too, saying that although she did not know much about the NFL, the movie and passionate performance of its actors were able to make her understand and feel the challenges and struggles that general managers of clubs might face in order to achieve what they desire. Verdict: Not as great and original as the likes of sports drama classics like Jerry Maguire and Moneyball, but it’s engagingly entertaining enough for those who wouldn’t easily get confused with the how it is with sports leagues in the US. Good thing’s that you don’t have to like the sport to enjoy this film.